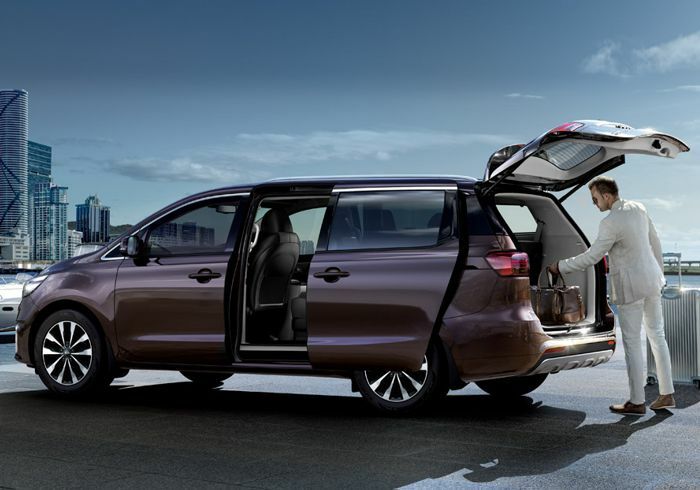 With its bold design, advanced convenience features and upscale cabin, the all-new KIA Grand Sedona has redefined and revolutionised the MPV segment, while a subtle facelift and extended technology has helped keep it a functional vehicle. We review the new KIA Grand Sedona at KIA Northcliff. The Grand Sedona’s front is defined by a more modern headlight configuration that looks sharper, with characteristic LED headlamps that are standard on SX and SXL trims. Situated in between the headlamps is KIA’s signature ‘tiger nose’ grille emphasised with a detailed mesh-like pattern, and a reconfigured bumper and air intake, which add a dash of sportiness. And because busy families appreciate a helping hand, a newly added power sliding door button located on the side door handles of EX trims provides easier access to the Grand Sedona’s luxurious cabin. Adding more flair to the model line is the SXL trim, which comes equipped with a unique bumper, skid plate, LED headlamps and fog lights, and 19-inch chrome wheels. The Grand Sedona offers a seamless interior with a state-of-the-art approach to comfort by ensuring that you have everything you need at your fingertips. The wide, horizontal centre console and plenty of space combine with luxury styling to provide flexible seating in both 7- and 8-passenger configurations. This multi-purpose vehicle also keeps its available third row which provides the convenience of a split folding 60/40, in-floor-retractable design. Peace of mind comes when safety is considered from every angle, and when power is combined with refinement and tranquillity. The all-new KIA Grand Sedona 2.2 CRDi EX comes with a substantial 147kW of power and 440Nm of torque, with a 6-speed automatic transmission. It offers advanced anti-collision features and a high-strength chassis to deliver maximum safety, allowing you to effortlessly rise above the toughest demands on your driving skills in any urban landscape, as well as driver and passenger, and side curtain airbags for added safety. Contact KIA Northcliff at 010 300 2029 for more information about the Grand Sedona, or to book a test drive.